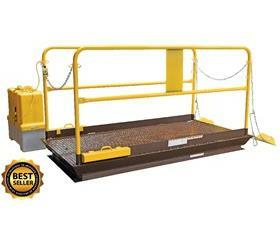 Autoquip PLTC Dock Lifts are specifically designed and built to be sturdy and reliable.&nbsp;Provides a versatile and convenient method of moving light to&nbsp;medium wheeled or palletized load both onto or from delivery trucks of various heights and onto or from your dock.&nbsp;Each PLTC Dock Lift meets ANSI MH29.1 industrial safety requirements.&nbsp;FOB Shipping Point. Saves time and reduces manhours where there are no docks. 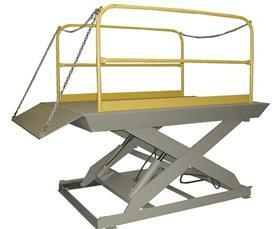 Checkered plate deck is made of heavy gauge steel for hard use. Hydraulic unit features emergency automatic stop if line breaks. Complete with upper travel limit switch, and overload relief. Push-button control&nbsp;is 24 volt on 20' coiled cord. Prewired control box includes Magnetic Starter and overload fuse. High visible hand rails are removable. Built for years of daily use, with minimum maintenance. Standard 6.5 HP 208-230/460 V, 3-phase, 60 Hz motor. FOB Shipping Point. <BR><BR><B>Two Speed Pump</B> <BR>Replace standard pump with 2 speed and increase lifting speed by 55% when lift is unloaded. <BR><BR><B>Warning Beeper &amp; Strobe</B> <BR>Sounds during the lift and lowering operation. 80 decibels. <BR><BR><B>Stop Signal Sign</B> <BR>Guides driver so truck will be properly positioned. 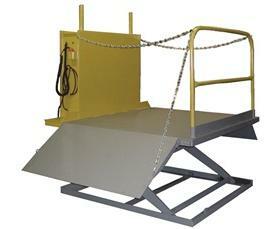 Prevents damage to the truck door and scissor lift. Driver backs up until truck touches signal arm. 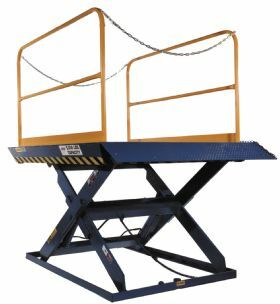 Adjustable height and projection for different truck-to-dock requirements.